Auroras showed up as forecast last night beginning around nightfall and lasting until about 1 a.m. CDT this morning. Then the action stopped. At peak, the Kp index dinged the bell at “5” (minor geogmagnetic storm) for about 6 hours as the incoming shock from the arrival of the solar blast rattled Earth’s magnetosphere. It wasn’t a particularly bright aurora and had to compete with moonlight, so many of you may not have seen it. You needn’t worry. A much stronger G3 geomagnetic storm from the second Earth-directed coronal mass ejection (CME) remains in the forecast for tonight. Activity should begin right at nightfall and peak between 10 p.m. and 1 a.m. Central Daylight Time. The best place to observe the show is from a location well away from city lights with a good view of the northern sky. Auroras are notoriously fickle, but if the NOAA space forecasting crew is on the money, flickering lights should be visible as far south as Illinois and Kansas. The storm also has the potential to heat and expand the outer limits of Earth’s atmosphere enough to cause additional drag on low-Earth-orbiting (LEO) satellites. High-frequency radio transmissions like shortwave radio may be reduced to static particularly on paths crossing through the polar regions. If you study the inset box in the illustration above, you can see that from 21-00UT (4 -7 p.m. Central time) the index jumps quickly form “3” to “6” as the blast from that second, stronger X-class flare (September 10) slams into our magnetosphere. Assuming the magnetic field it carries points southward, it should link into our planet’s northward-pointing field and wreak beautiful havoc. A G2 storm continues through 10 p.m. and then elevates to Kp 7 or G3 storm between 10 p.m. and 1 a.m. before subsiding slightly in the wee hours before dawn. The Kp index measures how disturbed Earth’s magnetic field is on a 9-point scale and is compiled every 3 hours by a network of magnetic observatories on the planet. All the numbers are lined up. 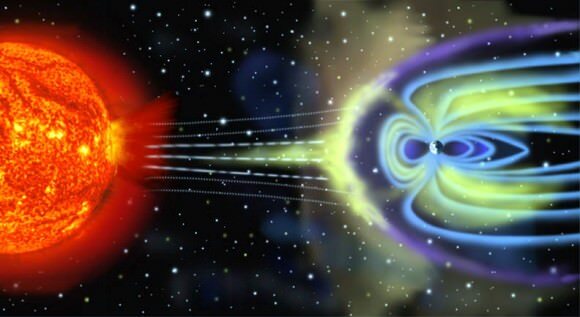 Now, will the weather and solar wind cooperate? Stop back this evening as I’ll be updating with news as the storm happens. For tips on taking pictures of the aurora, please see this related story “How to Take Great Pictures of the Northern Lights”. * UPDATE 8:15 a.m. Saturday September 13: Well, well, well. Yes, the effects of the solar blast did arrive and we did experience a G3 storm, only the best part happened before nightfall had settled over the U.S. and southern Canada. The peak was also fairly brief. All those arriving protons and electrons connected for a time with Earth’s magnetic field but then disconnected, leaving us with a weak storm for much of the rest of the night. More activity is expected tonight, but the forecast calls for a lesser G1 level geomagnetic storm. * UPDATE 11 p.m. CDT: After a big surge late this afternoon and early evening, activity has temporarily dropped off. The ACE plot has “gone north” (see below). Though we’re in a lull, the latest NOAA forecast still calls for strong storms overnight. Definite aurora seen through breaks in the clouds low in the northern sky here in Duluth, Minn. After a big surge late this afternoon and during early evening, activity’s temporarily dropped off. The ACE plot has “gone north”. * UPDATE 9 p.m. CDT: Aurora a bright greenish glow low in the northern sky from Duluth, Minn.
* UPDATE 7:45 p.m. CDT September 12: Wow! Kp=7 (G3 storm) at the moment. Auroras should be visible now over the far eastern seaboard of Canada including New Brunswick and the Gaspe Peninsula. I suspect that skywatchers in Maine and upstate New York should be seeing something as well. Still dusk here in the Midwest. Had a visible but fairly faint glow over a 180 degrees arc centered on azimuth 30 deg (NNE) from the end of sunset until dawn here in Penticton, BC (49.5N, 120W). The Moon didn’t hamper my observations at all and Jupiter rising well before dawn against a bluish background was unique to say the least. Clear conditions expected here tonight as well so it should be interesting. Potential aurora and its cloudy. Hope everyone else has more luck. Previous PostPrevious Weekly Space Hangout – Sept. 12, 2014: Rosetta Update!